Are you organizing a group or charity ride? Do you have a product to advertise or a cause to promote? 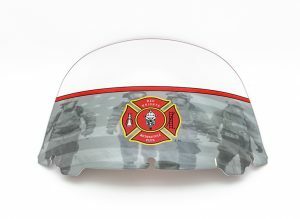 Do you want to memorialize a special person, pet, or day? 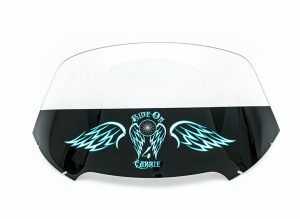 Contact our customization experts and we’ll work with you to create the ultimate custom motorcycle windshield. 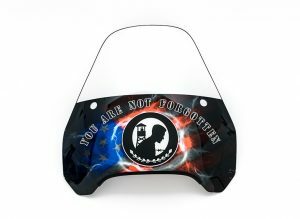 Slipstreamer can customize your windscreen to your specifications. And customize really does mean a custom job—we can print any graphic element, match a logo, even reproduce a photo. We can print from one color up to an unlimited number of colors. 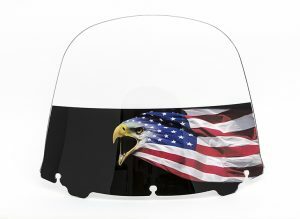 And we can go beyond the graphics to create a specific windscreen shape or height. And then match the tint of the windscreen to tie it all together. With our custom garage capabilities, you are limited only by your imagination. 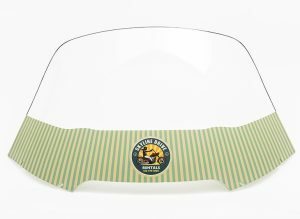 To create your custom windscreen, we scan your existing graphic or work with you to design the look. Then our industrial ink jet printer prints right on the windscreen. All images are back-side printed so they stay protected. 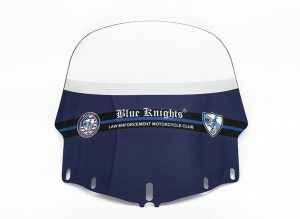 For one-ups or multiple runs, business logos, motorcycle/scooter rental companies, military, fire or police departments—let us help you design your unique look. Please contact us today and tell us about your idea. We’ll provide a quote on price and timing and then work with you through every step of the customization process. Use the contact form to send us a file. When supplying artwork for use in designing your custom windscreen, please adhere to the guidelines below to ensure successful reproduction. Vector art files are preferred (EPS or PDF). Photos should be submitted in CMYK and at a resolution of 300 dpi or higher. Acceptable photo file types include: JPEG, TIF, PDF or EPS. Logo files should be submitted as vector art (EPS or PDF file) with all fonts converted to outlines.